6057 Sea Serpent is a Castle set released in 1992. It contains two soldiers of the Black Falcons and a sailing boat of the Black Knights manned by three of their soldiers. The boat features two oars in its mid section as alternative means of propulsion besides the sail. There are also two steering oars mounted on the sterncastle. On the tip of the bowsprit is a small dragon figure that consists of dragon-styled helmet plumes. The small ship carries a cargo consisting of a single barrel filled with two yellow 1x1 rounds and a goblet on top of it. 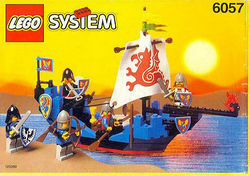 The dragon sail was only available in this set, as were the blue turret pieces for the forecastle and aftcastle. The two Black Falcons soldiers were the last minifigures of this faction included in a regular set. The only other Black Knights boat is 1547 Black Knight's Boat. Part:6066 in blue was only available in this set. Facts about "6057 Sea Serpent"